It seems that you can’t enjoy the benefits of exotic fruit oils on your skin care unless you spend hundreds of dollars. Here at Annmarie Skin Care, however, you’ll find super fruits like buriti in your formulas for less than half the price! 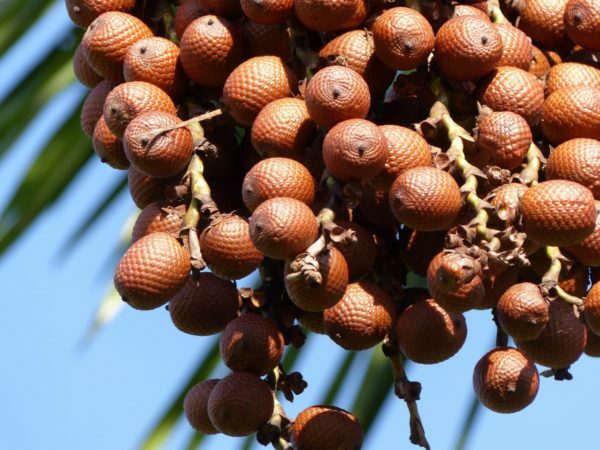 This fruit oil is one of those exotic wonders from the Amazon Rainforest, a product of the buriti palm tree which is known by the natives as the “tree of life.” In a way, that’s what buriti fruit oil does for your skin­—bring it back to life! Scientifically called Mauritia flexuosa, and also known as the moriche palm or ité palm, the buriti palm tree (pronounced bu-REE-chee) likes the swampy, wet tropical areas of South America, particularly in the Central Brazil and southern Amazon basin. It looks like most palm trees, with large leaves emanating from a rounded crown that’s typically around 35 meters (115 feet) high. Flowers are pale yellow blooms that typically come out from December to April. The fruit of the buriti is shiny, round, and chestnut-colored, with a bright yellow, fleshy pulp inside. The flesh surrounds a hard edible nut, which is the seed of the plant. Traditionally the fruit was used as a food source, and is still used today to make beverages, preserves, and ice cream products. Essential fatty acids: essential fatty acids—of which this oil is a rich source—help firm and tighten. This will help make your skin look more supple, but also provide moisture. Beta-carotene: Another powerful antioxidant, beta-carotene is known to protect. In fact, the oil is said to provide the richest known source of beta-carotene—even more than carrot seed oil. Vitamin C: Buriti oil is a good source of vitamin C, which works with vitamin E to provide antioxidant protection, and is also helpful in the . In addition to these benefits, this oil helps hold in deep hydration, and can help reduce the dryness of winter and mature skin, producing a more supple, softer look and feel. We've added buriti seed oil to the following products, where it provides superior protection while hydrating and moisturizing skin. How do you enjoy buriti? Have you tried this fruit in your diet? Please share your tips. Picture courtesy Eurico Zimbres via Wikimedia Commons. Darin Ingels, ND, MT (ASCP), “Beta-Carotene and Other Carotenoids Protect Skin from Ultraviolet Damage,” Bastyr Center for Natural Health, http://www.bastyrcenter.org/content/view/410/. this fruit is trully exotic, but can it work the way it is described in the post? I go to college in Canada and we just learned about this in our class. Thanks for helping me with the final part of my report.